Whether you’re a writer, musician, photographer or jewelry maker, getting the word out about your work is essential. With the advent of social media, it’s tempting to think of email marketing as a thing of the past. Why spend time writing, editing and refining an email campaign when you can just post the same information online and save yourself the trouble? While I’m a big proponent of a great social media plan for almost any business, the past year has taught me the value in having a complimentary email plan as part of your larger marketing strategy. While social media has rightfully taken center stage in most marketing efforts, ignoring the power and impact of email is doing your business a big disservice! Don’t panic! Segmentation is just a fancy way of saying ‘divide into groups’. It takes a little bit of planning to decide what sort of groups you’re going to want to set up, but it’s something anyone can do with a little bit of forethought and practice! One of the most powerful aspects of using email marketing is the ability to segment and track the reception of your campaign. Segmentation can be as simple as splitting your email list into two groups and trying out different emails with each group to see which gets the best response, to setting up wholly customized content groups. By allowing customers to choose what sort of content they’d like to see, you help ensure that you’re delivering the information that they’re going to be more inclined to read. In addition, by not sending your customers the information they’re not interested in, they’re less likely to become burned out and unsubscribe from your list entirely. On that note, the tracking capabilities of most email marketing services provide a great deal of information as to what content is actually engaging your readers and what is actively turning them away. Looking at how your last email was received and being able to compare it to previous efforts can give you a better context for what content your readers are likely to engage with and what content is actively driving them away. It’s 9 AM on a Tuesday and you log into Facebook ready to post a big announcement. You’ve planned the post in advance, ensuring that the image is exactly the way you want it, and that the copy is just right. You’ve carefully chosen the time window for the post, based on interaction numbers on previous posts. You log in, excited and ready to go, only to discover that the entire layout has changed. You vaguely remember seeing some announcement that this change was coming, but completely forgot about it in the bustle of running your business. After poking around a bit in the new layout, you realize that the standard image display dimensions have changed. Now your great imagery no longer looks quite so great when the dimensions are scaled up and the file size has been automatically compressed for quicker loading times. Your post doesn’t go out on time and doesn’t have the same impact you wanted it to. What recourse do you have? None really. Being dependent on an external party for your primary advertising platform means that you’re subject to the decisions of the platform owner. It may not happen often, but the impact can still be frustrating when you have time-sensitive information you want to communicate. Unless you’re paying for the service, you’re dependent on a platform that could at any point be unavailable or change on you. That’s not to say these aren’t incredibly valuable places to market your business, but they do create an additional level of dependency and risk that you need to be aware of when creating your marketing plan. In addition, limiting yourself to any one site means you’re excluding any potential customers that are either not on that site, or do not check into that account often. Even in the ideal case in which both you and your customers are on the same site, you’re still competing for their attention with every other Facebook Fan Page/Twitter account/Google+ account that customer is following. The longer a person is on a given service, the more competition you’re going to have for their attention. Email, on the other hand, goes directly to their private inbox. While you’ve still got to provide compelling content in order to get them to open your message, you’ve given yourself another, more targeted opportunity for engagement with your reader. Social media sites such as Facebook, Google+ and Twitter are fantastic for broadcasting information to anyone and everyone who might be interested in what’s going on with your business. While this is a fantastic way to promote your business, it’s still more of a customer-initiated experience. You’re relying on your readers to be engaged with that particular site, at a given time, in order to see the content you want them to see. The perception of this sort of communication (with the exception of direct messages or @ replies on Twitter) is that it is for everyone. While there’s nothing wrong with that, it doesn’t create the same sense of ‘specialness’ that more direct contact can create. If you’re actively creating content that your readers are interested in, delivering it to them directly via email is not going to be seen as spam (as long as they have opted in to receiving it! Always have an unsubscribe link, and never subscribe someone against their will). Instead, by providing specially curated content to your email subscribers you have the opportunity to provide a more personal, specialized message that your readers will appreciate and even look forward to receiving. Posting a discount code out to all of your social media followers (and hoping that most of them see it) – OR – Sending an email invitation to a segment of your top customers that gives them some insight into the sale event, and an exclusive discount code and/or early access to your wares. Without the ability to email your customers, the second scenario does not exist. You can attempt to target your communication using location and the time you post it, but it’s still open to the masses. Customers are less likely to engage and feel less personally appreciated when something is available to everyone and they are responsible for finding it. To get started using email marketing, take a look at some of the tools available, such as MailChimp, Constant Contact and Campaign Monitor. 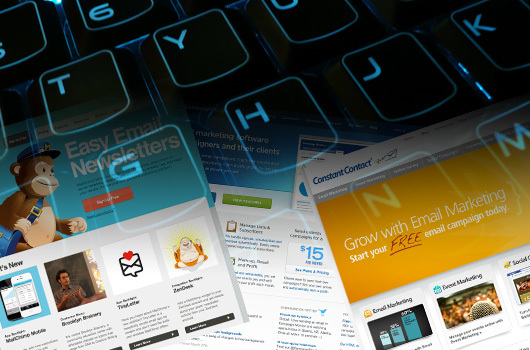 And check out part two of this article, where we dive deeper into email marketing.